It is the job of the critic to put aside one’s private prejudices and recognize when good art has been made. Darren Aronofsky’s new Bible epic Noah — I can’t believe I’m saying this — is good art. The film is provocative, elegant, bold, and beautifully directed. And, as predicted, it caused a stir among those who believe the film is about true events. I’m not a Christian so I cannot speak much about the controversy the film has generated, but after watching it, I have a pretty fair idea what their objections might be. I know the book of Genesis and don’t remember any giant rock creatures helping Noah build the ark. I confess I went into the theater biased. I love Aronofksy and his filmmaking (he has directed some of my favorites), but I wasn’t sure why he decided to make a Bible story. Haven’t Bible story movies come and gone from popular cinema? Aronofsky went against form. He decided not to market his new movie as a dark indie, but instead as a sweeping, CGI-heavy epic, which was upsetting. The latter approach appeals to conservative audiences, which aren’t Aronofsky’s fan base. After all these years of loyal support from us, the snobs of the indie world, we who fell in love with his masterpieces like Requiem For A Dream, The Wrestler, and Black Swan, it was jolting to see him pander to big, Christian Hollywood. But maybe Aronofsky was simply being financially savvy. 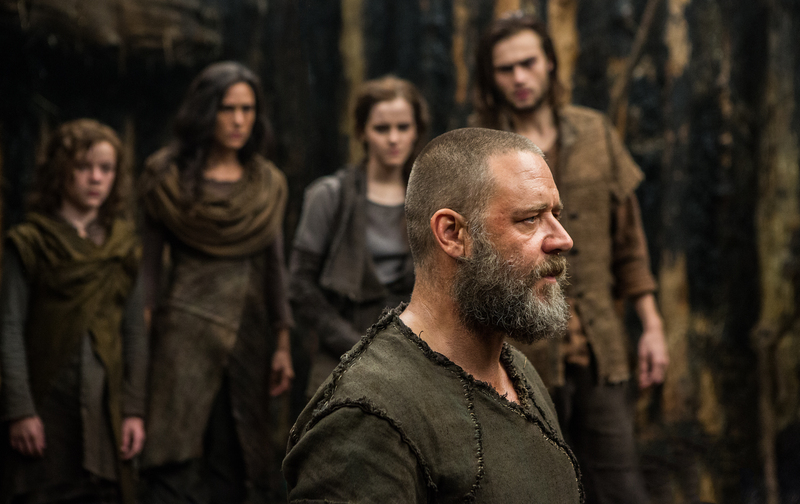 Branding Noah as a Christian epic brought audiences into the film, audiences who were surprised to find that Noah, thank god, is still an Aronofsky movie. With that opening sequence, the fish evolving into an ape, I knew we were being led by someone who doesn’t play by the rules. Russell Crowe plays a deeply flawed, brutally human Noah, a character who proves to embody the angry, obstinate, and ultimately self-destructive believer with uncompromising and violent faith. His performance is matched by Jennifer Connelly, his wife. The film may be one of Aronofsky’s best, so long as you view it and its source material as a titanic fable. If you’re looking for an exact rendition of the Bible story, you’re going to be disappointed and possibly angered. And that’s more fun for me. Aronofsky knew his film would cause heated discussion. Good art is meant to provoke, not instruct, but try telling that to Rick Warren and the rest of the Bible-thumping brigade. To be safe, he added a disclaimer at the end of the theatrical trailer after vocal Christians expressed early outrage. Religion is the enemy of art. It stifles its creation and casts out its creators. Millions of people all over the world will not appreciate the film because their faith blinds them. They will see Noah, like the story it pays tribute to, as an offering of truth, and how boring is that?